Messages can be sent immediately to all of your congregation so that important events such as funerals or meetings can be broadcast to everyone at once. Your church announcement can be recorded over the phone using our 800 number service. Messages can likewise be recorded on your own computer and download to our system over the internet. You can likewise maintain any number of contact lists of members who are to receive messages. Simply use our internet administrative page to designate the message and the list and push the start button. Complete online reports are available to show you the results of your message campaign. Contact DSC or visit our Church Calls website to learn more about our church call announcement systems and outsourcing services. Using our church calling service is easy and secure. Simply create one or more lists of call recipients offline and upload these list to your online account at DSC's website. Phone messages can be easily recorded using our 800 number service that lets you save numerous messages. Trinity Fellowship Church has contracted with Database Systems Corp. to provide phone message broadcasting services to its members. Messages are delivered to answering machines and individuals for event notification - especially funeral announcements where there is a very short window of time to notify its membership. Voice broadcast messages are also sent to church members for other special meetings and events. Why Use Automatic Church Calling Services? The following are just a few of the benefits and applications for this church calling service. 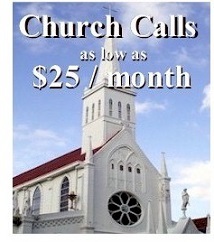 Contact DSC or visit our Church Calls website to learn more about our church call announcement services.